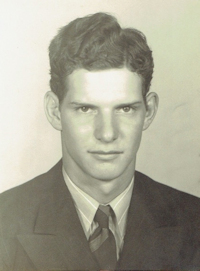 Obituary – Thompson, Lyell Floyd « Perry High School Alumni Association, Inc.
Lyell Floyd Thompson, b. May 10, 1924, died peacefully on March 10, 2014 at, Fayetteville, AR. Lyell is survived by his wife of 68 years, Marcella Horn Thompson, five children: Andrea Thompson Bevernitz (Kurt) of Little Rock, AR, Andrew Mark Thompson (Susan) of Tacoma, Washington, Susan Thompson Sklar (Charles) of Pisgah Forest, North Carolina, Kent Thompson and Kevin Thompson (Dana) of Fayetteville, Arkansas. He leaves eleven grandchildren and eight great-grandchildren as well as brothers Jack Thompson of Perry, Oklahoma, Don Thompson of Wichita, Kansas and Gene Thompson (Bernell) of Seagraves, Texas. His parents, Kenneth and Gladys Bowman Thompson as well as his sister, Mariella Thompson Crews, of Perry, Oklahoma, pre-deceased him. After serving in Europe from 1943-1946, where he fought in the Battle of the Bulge and subsequently received three battle stars and a purple heart, he returned home and married his high school sweetheart, Marcella. He graduated with a BS from Oklahoma A&M (1948) and a PhD from Ohio State University (1952) before beginning work as an Agronomist with a focus on soil fertility at the Samuel Roberts Noble Foundation in Ardmore, Oklahoma. In 1958 he joined the faculty of the College of Agriculture at the University of Arkansas in Fayetteville where he taught and did research until his retirement in 1991. He was the major advisor of some thirty MS and PhD candidates. He worked with all aspects of soil fertility but his major interests were with trace element nutrition. His research led to boron, molybdenum and zinc recommendations for Arkansas crops. He published a number of scientific papers and was recognized for excellence in the classroom when he received the 1983 Gamma Sigma Delta Outstanding Teacher Award. Lyell was active in the Civil Rights Movement throughout the 1950s and 1960s, serving on the Arkansas Council on Human Relations and was appointed to the Arkansas Advisory Committee of the U.S. Civil Rights Commission. In the words of Martha Davis, “He was the first professor at the University of Arkansas to employ a black student; he housed black students in his home when university housing was still not open to them; he went door to door to promote opening to blacks the city swimming pool, the movie theaters, and the restaurants across town. He often risked his career to support unpopular issues that he believed in, and his efforts made the way less risky for those he led and those who have followed his example.” Equality for all was a founding principle of his constitution. He was a vibrant member of the Northwest Arkansas Community. He served in the Active U.S. Army Reserve retiring as a Major. He served 18 years as Washington County Justice of Peace on the Quorum Court. As a Justice of Peace, he enjoyed officiating at weddings in Washington County and performed around 1,400 ceremonies during and after his term. He was instrumental in the development of the UARK Federal Credit Union. He was a member of the Unitarian Universalist Fellowship in Fayetteville, and was honored to support the growth of the organization and its building. Lyell read poetry and engaged in story telling before retirement groups and on the local public access TV and local radio stations. He was active in the Tellers of Tales society, which serves to preserve oral history. 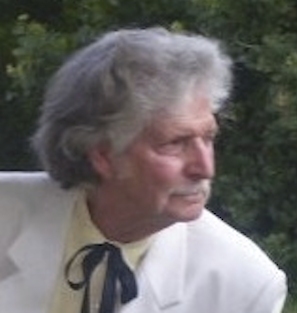 He characterized and portrayed before many groups as “Mark Twain”, in costume, to whom he had an undeniable resemblance and shared Twain’s sense of humor. Lyell was an early proponent of recycling. His commitment to recycling seemed boundless. The style of Lyell’s recycling was such that he often recycled things in-house when he couldn’t find the resources to recycle them externally. He started with recycling cans, clothing found on the streets and roadways, plastic cutlery, and any sort of paper product, with a special emphasis on paper napkins from restaurants. This commitment stemmed from his deep affection for and appreciation of our living planet. Lyell was well known to many as a “tree giver” and a “tree planter.” Lyell knew many varieties of trees and was never shy about asking anyone he was keeping company with, “What kind of tree is that?” as an opportunity for a learning moment. One of his favorite days of the year was National Arbor Day at the end of April. His front yard bears a gigantic symbol of the labor of his love in the form of a tulip poplar. He planted it in the mid-eighties and took exquisite care of the growing sapling over the following decade until he was confident that his tree was going to be a fine example of what a tulip poplar should be. Over his tenure on the University of Arkansas, he planted innumerable “rescued” seedlings and saplings on campus. He was always keen to point out and say, “I planted that tree.” A number of those “rescues” live as specimen trees today on and around the campus arboretum.